Founded in 1949 as a cooperative of Midwest libraries, the Center for Research Libraries (CRL) has grown into an international consortium of more than 200 university, college, and independent research libraries. The GC’s Mina Rees Library is a member of CRL and through our affiliation we have access to a vast shared collection of print, microfilm, and digital resources that fall under four broad collecting areas touching every corner of the globe: News; Law and Government Information; Science, Technology, and Engineering; and the History of Economics and Agriculture. One can think of CRL as the library’s library since many interlibrary loan requests from Grad Center researchers are filled via the CRL’s rich and uncommon collections of primary sources. CRL holds millions of pages of archival documents from U.S. and international sources, more than 16,000 newspapers from every region of the world and every U.S. state, more than 800,000 non-U.S. dissertations, and major collections of news, government documents and archives from Africa, Latin America, the Middle East, Europe, Asia, and South Asia. A key benefit of our membership is that CRL will purchase difficult-to-find foreign Ph.D. theses and dissertations that our researchers have requested and then loan them to us for our patrons. Purchases can take three months or more, but when CRL is our sole avenue for obtaining these items, it is usually worth the wait. 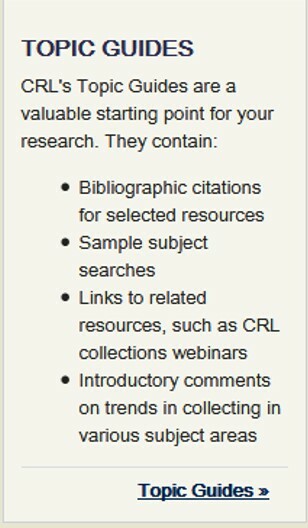 A great way to discover CRL’s collections is by consulting the CRL Topic Guide on a subject. The nearly forty Topic Guides include African Studies, Human Rights, Music, Science and Technology, Latin American Studies, and Legal Databases: Comparative Analysis. The Topic Guide for News details the scope and strengths of the collections — African-American newspapers, Civilian Conservation Corp. Camp papers, underground and alternative press titles, and U.S. ethnic newspapers — and links back to browsable lists of individual item records in the CRL catalog which may be further filtered and sorted. The guide also highlights collections of radio broadcast reports and transcripts, U.S. newspapers from 1843 to the present, and U.S. Daily Reports of the Foreign Broadcast Information Service from around the world covering the years 1941 to 1995. Another way to find materials is to search across all the holdings of CRL through the online catalog. Use the basic or advanced keyword search or search the CRL’s collections of Serials, Newspapers, Dissertations, or Digital holdings individually by selecting the corresponding tab. One notable feature of the catalog is the ability to search by the Library of Congress Classification Number. Limit results by location (CRL collection), language, date, etc. When you discover an item you would like to use, you may request it via interlibrary loan. Just select the Graduate Center from the list of CRL members under “Request Items from CRL,” log into the ILL system with your GC network credentials, and fill in all the bibliographic details for the item. Do note, however, that if speed is of the essence, you will receive the fastest turn-around on ILL requests when you make them through WorldCat or GC databases, especially with non-Roman alphabetized foreign language materials, because the direct autofill feature makes requests more precise. When the GC borrows materials from CRL for our researchers, loan periods are unlimited but materials may be subject to recall if requested by another member. The digital collections highlighted by CRL include fascinating historical documents from around the world, including African newspapers published between 1800 and 1922; Brazilian government documents issued between 1821 and 1933; and Chinese pamphlets published from 1947 to 1954, among others. So log into CRL with your GC network credentials to access unparalleled collections of primary sources from around the world.